No campaign theme is more gripping than a battle against the minions of hell! This jam-packed sourcebook brings to the table everything you'll need to run a fantasy campaign centered around demon hunters. From puritanical holy men fighting for their gods to crazed warriors only one step away from damnation themselves, every classic archetype is covered - with new ones introduced as well. 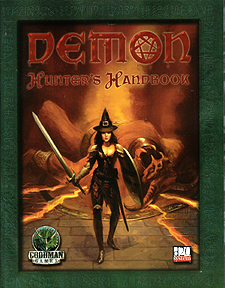 The handbook focuses not only on new classes, races, and feats, but also covers ways to tailor the existing d20 canon to a demon-hunter theme. It includes rules for possession and exorcism, organizations both pure and demonic, and guidleines for creating truly villainous demons to hunt.